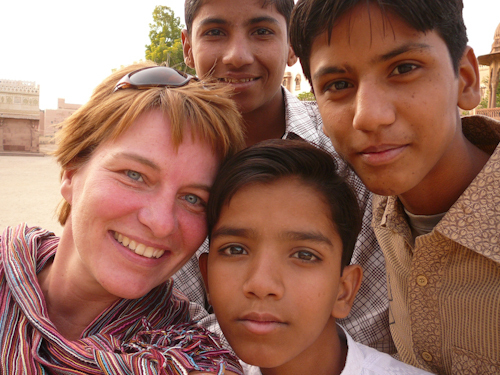 These boys followed us around Junagarh Fort in Bikaner, India relentlessly asking questions. Their parents were clearly embarrassed and exasperated but the boys just had to know. We finally agreed on a picture in exchange for some answers. Aren’t they adorable? Awe, what a sweet picture. Some of my favorite memories of traveling are the meet ups with children. I love the curiosity they have. Are the back two boys quite a bit taller than you Gillian, tee hee! I got here through facebook :) … not sure how. One of the well maintained forts in India. Loved Meharangarh too ! Take care and have fun traveling in 2012 !! !